Please Read the steps of operating your Swift ATM card. 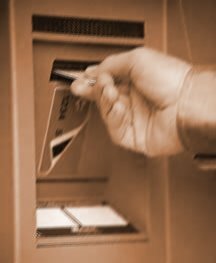 ATM means Automatic Teller Machine. An ATM a machine that dispenses cash to account holders or accepts cash deposits. The transaction is initiated and concluded with the use of a magnetic stripe card or smart card. The ATM card has either a magnetic stripe or a processor (or chip) that allows data or information to be stored or processed in it. ATM s are a quick and convenient way to access money in your accounts.The total is amount deposited in your card. Look at the Screen as shown above, Insert your card when prompted to do so, with the red surface facing up and ensuring that the edge with the white arrow sign goes in first. Enter your PIN number that will be given to you in the next details using the keypad and press the “PROCEED” button.From the list of transaction type, select the “INQUIRY” option. Select “CHECKING” for current account, “SAVINGS” for savings account and "CREDIT" for mastercard account. NB: Be sure your account type is linked to your card. Making a “BALANCE INQUIRY” on an account that is not linked to your card will generate an error “invalid account selected” that is why your account has to be activated before your card will be delivered. Select “CHECKING” if you are withdrawing from your current account , “SAVINGS” to withdraw from your savings account, or Credit to withdraw from your ATM card account. Select from the list any amount you intend to withdraw. Otherwise select ‘OTHERS’ if the amount you want to withdraw is not in the listing. Enter the amount you want to withdraw e.g. $5, 000 and press the ‘PROCEED’ button to process your transaction. NB: The Minimum amount you can withdraw per transaction is $5, 000 While the maximum you can withdraw in a day is $50,000 ie maximum of three transactions per day. Enter your new PIN number and press Proceed button. Re-enter the new PIN again and press Proceed button. NB: Kindly ensure you end the present transaction and reuse your card by entering your new pin number. Then, do a balance inquiry to confirm the pin change was successful. Fund transfer is now enabled for all customers to transfer between their Current,Savings account and ATM card account. You might be very verse with the swift credit card system through the (a.t.m) automated teller machine system that allows beneficiary’s direct access to make withdrawal of fund from any international banks in the world. Payment was adopted to reduce the administrative protocols as regards (cost of transfer, vat, taxes and levies), it was adopted to help beneficiary who are financially down, who are not capable to meet up with the obligation of paying banks as a result of fee administrative and handling charges. The swift credit card system will only cost beneficiary the cost of shipment via Dhl or Fedex courier services and activation of account which involves little expenses . Be informed, that your information was received for direct programming ofthe swift credit card electronically device payment instrument. There fore you are adviced to reconfirm the below information to us. Feel free to ask question where you neededclarification and call me on my direct line 234-1-8762-645, for details. As soon as you are ready to receive the swift credit card do inform me so that i can activate the cards and instruct you on how toget intouch with the payment officer for the shipment as stated above .